Posted By:Unknown | At:9:53 PM Be the first to comment! 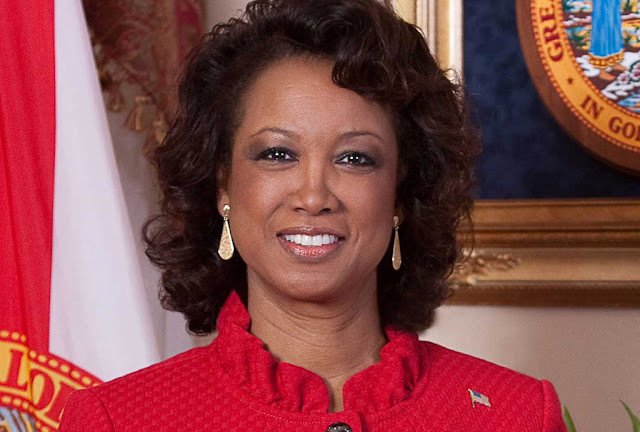 (Reuters) - Florida Lieutenant Governor Jennifer Carroll abruptly resigned after an Internet cafe company that was her former consulting client was linked to an alleged illegal gambling racket, state officials said on Wednesday. Carroll, who was not charged with wrongdoing, sent a brief note to Governor Rick Scott on Tuesday tendering her resignation. She is a Republican and was the highest-ranking woman in state government and the first black official elected statewide. Her resignation came hours before authorities announced that 57 people had been charged in a $300 million conspiracy allegedly orchestrated by Allied Veterans of the World, a non-profit organization that runs Internet cafes. Carroll was co-owner of a public relations firm that represented Allied Veterans and worked for the group during some of the seven years she served in the Florida House of Representatives. She said she was cooperating fully with the investigation. "Although I do not believe I or my company are targets of the investigation, I could not allow my company's former affiliation with Allied Veterans to distract from the administration's important work for the families of Florida," Carroll said. Operation "Reveal the Deal" uncovered what law enforcement officials described as a "sophisticated racketeering and money laundering scheme stemming from 49 illegal gambling centers operating under the guise of Internet cafes," according to a press statement from the Seminole County Sheriff's office. "The organization falsely claimed to be a charitable veterans' organization, but instead deceived the public and government while lining the pockets of its operators," it said. Investigators said the group took in $300 million from January 2008 to January 2012 but gave less than 2 percent to charity. The investigation began three years ago after a World War Two veteran stopped into an Allied Veterans storefront and said to himself, "My God this isn't about veterans, it's a casino," said Seminole County Sheriff Donald Eslinger. The governor said he would wait until the legislative session ends in May to choose a replacement for Carroll. Carroll took office as lieutenant governor in January 2011 and focused on aerospace job development and working with military contractors to increase economic activity of the armed forces in Florida. She is a former Navy officer and previously was executive director of Florida's Department of Veterans Affairs. Tuesday's arrests were made across Florida and in five other states, including Oklahoma and South Carolina. Investigators seized slot machines and records from Allied Veterans of the World gambling centers across the state, as well as 80 vehicles and vessels, 170 properties and 260 bank accounts estimated in the tens of millions of dollars. Among those arrested were Johnny Duncan, 62, former national commander of the organization; Jerry Bass, 62, the current commander; Chase Burns, 37, the owner of a company that allegedly provided the software used by the gambling centers, and Kelly Mathis, 49, the organization's attorney. Also arrested were Nelson Cuba, 48, and Robert Freitas, 47, both of Jacksonville, Florida, who were identified as law enforcement officers who serve as the president and vice president of the Fraternal Order of Police's Jacksonville Lodge.